Press release download service for J D Neuhaus. BOP Handling Equipment - CE Marked and ATEX Certified - Of Course! J D Neuhaus, world leading manufacturer of pneumatic and hydraulic hoists will be showcasing their new Mini series of air hoists at the 2018 CeMAT exhibition, taking place on 23-27 April in Hannover, Germany. On display in hall 24, booth A54 throughout the show will be a Mini 500 hoist, just one of the models in the new range. Developed using 20 years of experience of the previous model along with suggestions and collaboration with many customers both before and during new development, the new Mini represents the highest benchmark in hoisting technology. The new Mini is available in four lifting capacities of 125kg, 250kg, 500kg and 980kg and is ideal for a wide range of light/medium manufacturing applications no matter what the environment, whether it be wet or dry, hot or cold, in dust-free rooms or extremely dirty conditions or in areas where an explosive atmosphere (Zone 2) is present. The new model incorporates a multitude of enhancements and innovations to maximise productivity, occupational safety and efficiency. The smartest new feature being the unique integrated NFC tag meaning operation instructions and certificates for the hoist can be accessed by the end user via the JDN service app. The Mini’s maintenance tasks are greatly improved with much of the necessary maintenance work, such as lubricating the motor chamber, exchanging the chain guide or even changing the motor unit, now being carried out ‘on the hook’ without dismounting the Mini. Through targeted optimisation, the number of operating hours has been doubled, allowing it to stay in operation for 800 hours, considerably enhancing efficiency and providing an important contribution to the reduction of total cost of ownership. JDN have brought together the advantages of direct and indirect control of the hoist. Three control lines are bundled within one hose to keep the lines from twisting and providing more flexibility and operating comfort. New precision valves administer a more precise dosing of the air supply to ensure smooth lift and lowering of loads. Lifting speed can be adjusted up to a maximum 12 metres per minute at a full load (mini 500), making it 20% faster than the previous model. Lift speed can also be adjusted without loss of power providing better protection of loads without compromising speed control. A new global innovation is the redundant optional fall support capable of holding the maximum capacity of a hoist coming free from the support structure. 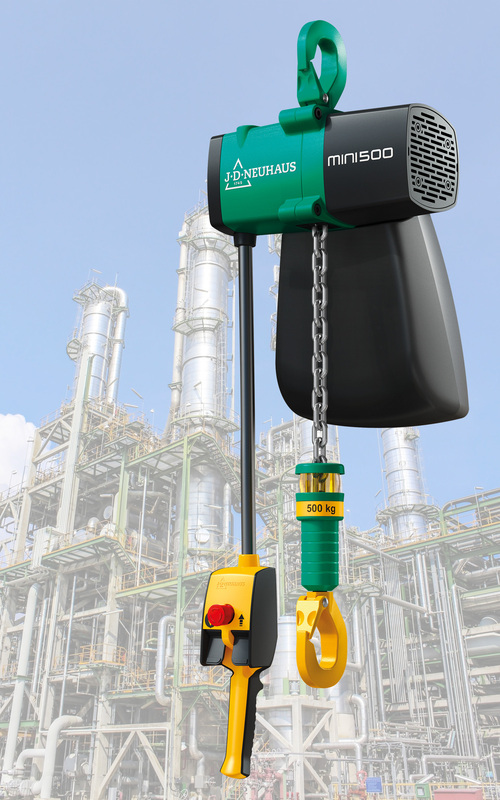 New limit switches offer another safety improvement, capable of switching off the lifting and lowering movement as soon as the bumper touches the stop valve. This slows movement and keeps the chain from being overloaded. Wear risks and safety hazards are therefore minimised and occupational safety is improved significantly. For flexibility, a standardised interface for using various types of hooks has been developed with hooks also available in steel and stainless steel. Load sleeve, chain and chain guide are available in stainless steel, the motor housing is also available in uncoated cast aluminium. This makes the JDN Mini ideal for use in fields such as the food industry. Further information on the new Mini series can be seen at www.newgreatmini.com. At its location in Witten, Germany, J D Neuhaus, employ over 200 staff companywide, producing pneumatically and hydraulically operated hoisting devices and crane systems. Its internationally unique specialisation means that J D Neuhaus not only sets the benchmark for quality in their field, but with customers in over 90 countries is also the world market leader. The products are characterised by their ability to steadily and reliably move loads of up to 115 tonnes even under the most extreme conditions of use and with protection against explosion. For gas and oil movement, for example, under Arctic temperatures as low as -45°C, under water for ship repairs, in mining, in the chemicals industry, in heavy machinery construction, and in many areas of logistics. J D Neuhaus supplies a total of around 70 industries. Production takes place exclusively at the Witten location and the wide selection of products is complemented by services such as installation, inspection, maintenance, and general overhauling of the systems as well as training for customers. In collaboration with international partners, JDN affiliate companies in France, Great Britain, Singapore, and the United States form a close-knit distribution network that spans the globe. The export portion is over 80%. Founded in 1745 as a family company, the business is now a seventh generation family-owned company. The hoisting device museum at the Witten location showcases this history as a lively part of corporate culture. J D Neuhaus company information and contact details for JDN Worldwide can be seen here. Copyright Enterprise Marketing Services Ltd.